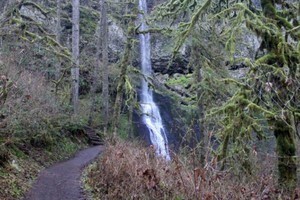 Tucked into the northwest corner of Portland, the Wildwood Trail weaves for more than 30 miles through Forest Park.
) does a good job of keeping the invasive English ivy under control and maintaining all the trees and shrubs. The region’s moderate climate does the rest, allowing for a variety of leafy specimens. 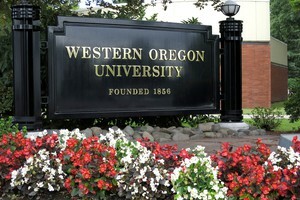 It’s gorgeous in spring. 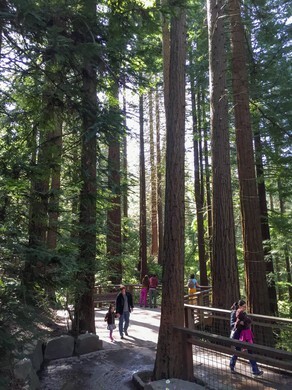 The redwood grove is one of the many highlights of the first leg of the Wildwood Trail. Pittock Mansion is a short walk off the Wildwood Trail’s second leg and provides a tremendous view of Portland and Mount Hood. 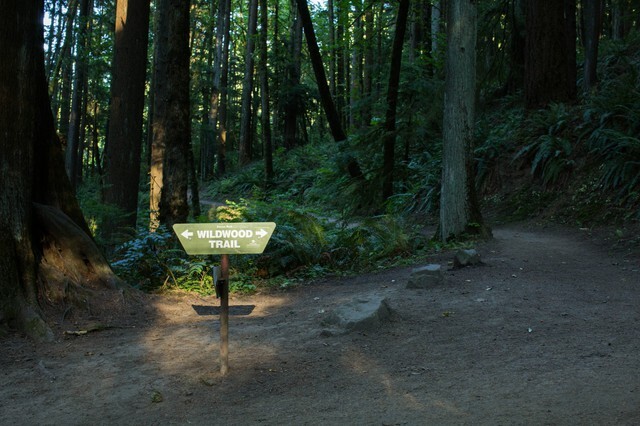 Wildwood’s second leg stays cool during the golden hours under the tree canopy, sunlight peeking through where it can. that are known to nest in Forest Park. Except for some remnant garlic mustard, invasives like English ivy give way to a landscape of natives. In spring, clusters of oyster mushrooms erupt from some of the trees and any ground not covered with maidenhair, bracken or sword ferns is dotted with giant trilliums and brilliant yellow johnny jump up violas. 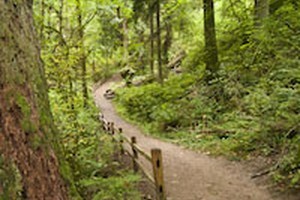 Groves of vine and bigleaf maple fill in between stands of timber. It’s an area worth revisiting in October when the turning leaves splash the deep forest green with bright red, orange and yellow. 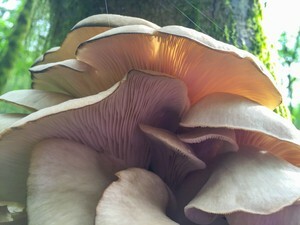 In spring, clusters of oyster mushrooms erupt from some of the trees. This sign marks one terminus of the Wildwood Trail at Newberry.